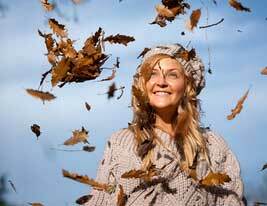 This woman is catching leaves as they fall off a tree. The leaves are brown and dry. Rakes are used to gather leaves. 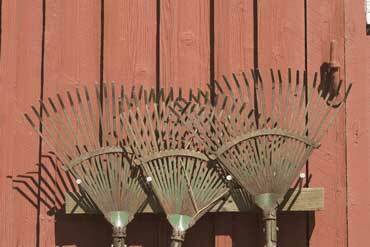 Rakes have long thin wooden handles with a set of prongs on the end of the handle. 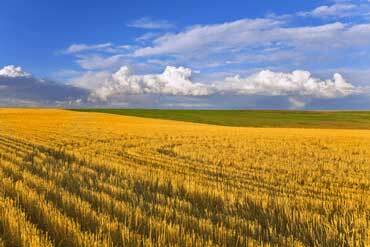 The crops in this field were harvested. Trucks took the crops to a warehouse. Copyrights to the pictures and photos on this ESL lifeskills lesson and EL Civics website belong to individual photographers. We have purchased the rights to use them. Do not copy the images on this ESL website. Permission is granted to print any of the worksheets for classroom or home study. You may link to any page of this educational website. Contact Christina Niven, ESL teacher, at christina@elcivics.com. Please send requests for new ESL and lifeskills lessons. Copyright © Christina Niven, 2007.